Thailand’s ruling junta, formally known as the National Council for Peace and Order (NCPO), seized power in a military coup on 22 May 2014. The NCPO has repeatedly postponed its election timeline, making it the longest military-led government in Thailand since the 1980s. When the Election Commission of Thailand finally opened the party registration process on 1 March 2018, a number of new political parties registered to compete in the long-awaited elections, currently scheduled for February 2019. The increasingly close association between Thanathorn and the FWP can make the party more vulnerable in the long run. One of the most prominent among these new parties is the Future Forward Party (FWP) founded by young billionaire auto-parts tycoon Thanathorn Juangroongruangkit. Committed to democracy and democratic values, the party seeks to build its electoral platform around issues such as removing the military influence over Thai politics, reforming the junta-drafted constitution (in force since April 2017), fighting corruption, and decentralising Thailand’s administration. It seeks to project itself as a progressive, anti-junta, pro-democracy party that is run by and works in the interests of Thai people. Since its inception in March 2018, the FWP has invested a lot of time and effort into building a strong party brand centred on three pillars: charismatic leadership, youthfulness and a progressive anti-junta agenda. Thanathorn Juangroongruangkit, the FWP founder and party leader, is a young successful businessman with little political experience. He comes from a wealthy Bangkok family that belongs to the richest 1 per cent of the Thai population, although he claims to represent the interests of ordinary Thais. This has earned him the moniker ‘billionaire commoner’ in the Thai media. Thanathorn is charismatic, outspoken and highly marketable. Despite insisting that he is building a national party whose faith is not linked to the faith of the leader, Thanathorn has taken much of the party’s limelight. His public Facebook profile, with 132,000 likes, has outperformed the official FWP Facebook page, trailing behind with 85,000 likes. Khaosod, a well-known Thai newspaper, has recently referred to Thanathorn’s following as a ‘fan club’, indicating the country might be experiencing Thanathorn-mania. However, the increasingly close association between Thanathorn and the FWP can make the party more vulnerable in the long run. Thanathorn is frequently compared to Thaksin Shinawatra, another billionaire businessman-turned-politician, who is at the heart of Thailand’s political conflict which has already lasted more than a decade. Thaksin rose to power in the 2001 elections as leader of the newly-formed Thai Rak Thai Party, campaigning on a progressive political agenda. As prime minister, he implemented a number of fiscal policies in favour of the poor that enjoyed strong support in Thailand’s populous north and northeast. However, Thaksin encroached on the power and privilege of Thailand’s traditional elites (the monarchy, the military and the bureaucracy) and was ousted from power in a coup in September 2006. The coup did not stop his popular appeal, however, and the post-coup elections in 2007 and 2011 were won by pro-Thaksin parties. A government led by Thaksin’s sister, Yingluck Shinawatra, was deposed in the coup in May 2014. Although Thanathorn denies that he is simply another Thaksin, his critics like to point out that his uncle, Suriya Juangroongruangkit, was a senior minister in Thaksin’s cabinet between 2002 and 2005. Thanathorn himself joined the 2010 protests staged by Thaksin’s supporters against the then government led by the Democrat Party, and voted for Yingluck Shinawatra and the Phuea Thai party in the 2011 elections. These links between Thanathorn and Thaksin might have adverse effects for the FWP due to Thanathorn’s close association with the party brand. Some critics already view FWP as another party within the Shinawatra camp. Youthfulness is another key pillar of the FWP brand. Thanathorn co-founded the FWP together with Piyabutr Saengkanokkul, a young public intellectual and former law scholar, and 26 new-generation Thais comprising university students, entrepreneurs and pro-democracy and rights activists, most of whom are in their twenties or thirties. Their interests and activities range from LGBT rights and disability campaigning to beer crafting, all of which are essential to the party’s youthful hip brand. The FWP seeks to project itself as a party of the new generation that does not identify with either side of Thailand’s political conflict. Focusing on the young might prove to be a good strategy, as there will be over seven million first-time voters by February 2019 and the FWP needs to capture their interest. 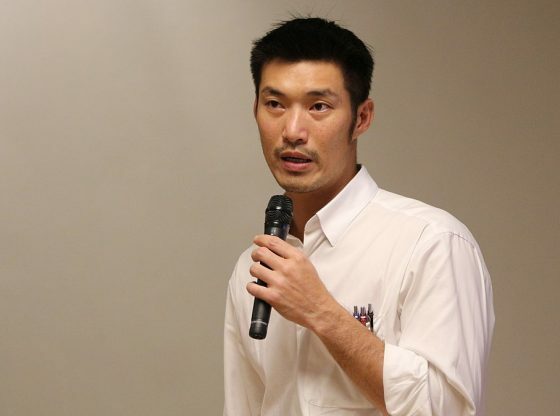 Thanathorn has repeatedly described FWP as an alternative to Thailand’s two biggest parties, Phuea Thai and the Democrat Party, which represent the rival political camps. This is reflected in the FWP’s use of the colour orange in their branding, although the party claims this was unintentional. Orange, a combination of red and yellow, references the colours associated with the other two parties. The colour red is linked to supporters of Thaksin and his political networks who typically align themselves with the pro-Thaksin Phuea Thai party, while yellow is connected with those who oppose Thaksin and support Thailand’s traditional elites. They typically align themselves with the Democrat Party. A progressive anti-junta agenda is the final pillar of the FWP brand. The party’s policy framework is formulated in the easily comprehensible marketing-style jargon of ‘3Ps’: the removal of obstacles to Thailand’s development (plot lok), decentralising power (prap khrong sang), and increasing opportunities (poet okat). Much of this policy framework is related to removing the NCPO’s influence over Thai politics, restoring democracy and providing social security in the form of universal state welfare. The FWP’s anti-junta agenda is also frequently reiterated in its social media content, which openly mocks the NCPO. For example, the FWP does a weekly Facebook Live broadcast called ‘Returning Fridays to the People’. This is a tongue-in-cheek response to NCPO leader and Thai prime minister General Prayuth Chan-o-cha’s weekly broadcast ‘Returning Happiness to the People’, which aired weekly across all Thai TV and radio stations for two-and-a-half years following the 2014 coup. The party also enjoys the support of Kai Maew, an anonymous anti-junta Facebook cartoonist with a strong following, who designed a number of cartoons for the party to use on their merchandise and as party props. Among these are two cartoon cardboard cut-outs of Thanathorn and Piyabutr, the FWP secretary general. The party uses these cut-outs to mock General Prayuth, who used a cardboard cut-out of himself at a media conference in January 2018 to avoid reporters’ questions. However, the FWP progressive anti-junta agenda has proved to be a double-edged sword. Thanathorn and two other executive party members have recently been charged with violating the NCPO’s Computer Crime Act for spreading allegedly false information about the junta on Facebook. This is an offence that can result in a five-year prison sentence. Whether the FWP can succeed at the February 2019 elections remains to be seen. The party has generated much public excitement and raised hopes for many Thais who have grown disillusioned with the country’s politics. However, FWP continues to face many obstacles, including those presented by its own party brand. Even if it wins some seats, it is unlikely that FWP will have any substantial impact on Thai politics as the NCPO has ensured that its influence will continue well beyond the next elections. The military-drafted 2017 constitution, which is almost impossible to amend, allows for a non-elected prime minister and binds future governments to follow the NCPO’s 20-year National Strategy reform plan. Petra Desatova is a PhD student at the School of Politics and International Studies at the University of Leeds. Her doctoral research addresses the phenomenon of nation-branding on the example of post-coup Thailand (2014–2016). Image Credit: CC Wikimedia Commons.